It started off as a joke - a little irony directed at the Martha Stewart mindset that anything less than the perfect pork roast could potentially unhinge the cosmos - but as time has passed it has become less of a witticism and more of a manifesto. When the kids were small I remember thinking that family dinners were a tool to bind us together as a family for the time we lived under the same roof. They would help Jeff and me to raise our children to adulthood with good dialogue and good nutrition. Check, and check. Family dinners were a snap back then. Now, four adolescents and their accompanying schoolwork and schedules have made shared meals more of a challenge than I ever anticipated, even with our notoriously stingy approach to activities. But I’ll continue to fight for family dinner around our table. It is where little heads learned to bow in prayer, little hands learned to serve one another, little voices learned “please” and “thank you” and how to take turns in a conversation. It is where we learned to read the Word as a family and to talk about how it changes us. More and more, it is a place where we are all learning that we would rather be together than apart. Friendships may wax and wane – this year’s best friend may be next year’s acquaintance because of a schedule change or a falling out, or anything that severs the fragile thread of our overlapping experience. But the people who remain constant in our lives, the relationships worthy of our deepest investments, are our family. With family, overlapping experience is not a fragile thread but a strong cord, binding us together and lending us the strength we need to navigate the years ahead. And that’s why much depends on dinner. Though work, school and activities may pull us in different directions, nightly dinner is our chance to sit down together and strengthen the cords of family. Dinner is the time we gather to share not just a meal, but the stories of our day, our victories and losses, our observations and questions. Though it may happen at other times as well, dinner is the time of day when biblical community consistently happens in our home. I hope that we are building at our kitchen table a bond that holds not just for the eighteen or so years we will share the same roof, but for the 60 years after those – years during which our children will navigate marriage, having children of their own, job successes and failures, moves, the decline of their parents, and their own aging as well. Whether we like them or not, our family travel the length and breadth of life with us. How much better, then, to like them? To welcome their company on that path? 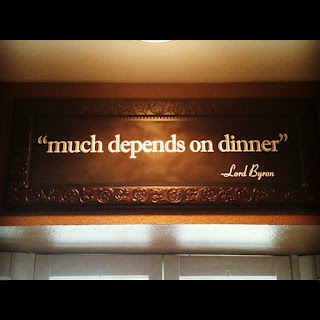 Yes, much depends on dinner because dinner deepens our dependence on each other. It binds us together for the long haul. And we will need each other for the years ahead. Here is what I am coming to realize: there is only one shared table in this life more holy than that table in my kitchen. This lesser communion we gather for each night whispers of that other table: the breaking of bread, the sharing of truth, a nightly remembrance of what matters most. No, not a sacramental meal, but certainly a sacred one. This lesser communion we gather for each night differs from that other table: its gaze is fixed not backward but forward. Tonight we gather as parents and children, but one day we will gather as brothers and sisters. Tonight we hunger and thirst for food that will fill us for a time, but one day our hunger and thirst for righteousness will be satisfied. Tonight we give thanks together around a simple kitchen table, but God willing, one day we will give thanks together around a banquet table in the presence of the Lord. I want my children there. I want my children’s children there. 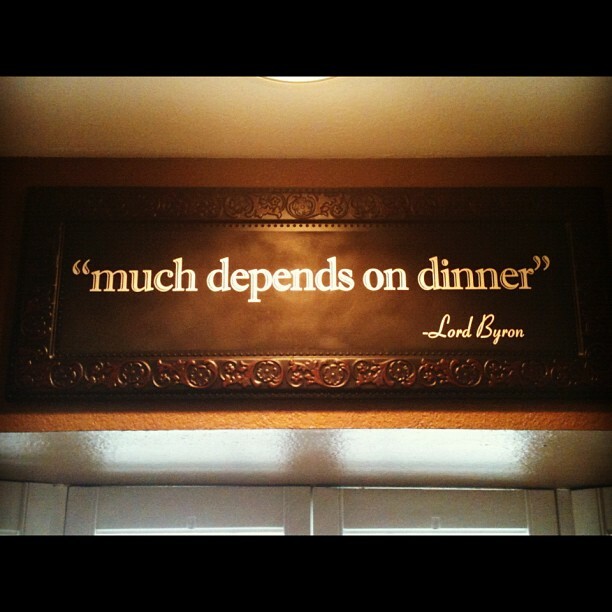 So, yes, much depends on dinner. No coach or choir director or church program or career gets to supersede this ritual. Whether we dine on chateaubriand or cereal, this nightly intersection of our lives means strength for today and hope for tomorrow. We will not grow weary of meeting together. A table is prepared for us. This is the place where we are fed. Thank you for this encouragement! Perfect for today! This is the first post I've read here and I loved it! Thanks for sharing.